Today my daughter and I made our first mug cake together. A nice yummy treat made in under ten minutes. The recipe I had was from my new Mug Cake Cookbook. 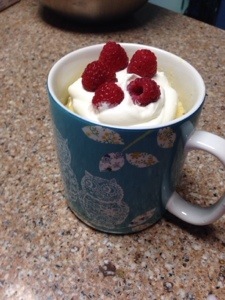 We tried the first one listed, a yellow cake and added some homemade whip cream and fresh raspberries to top it. It was so simple and quick to make. 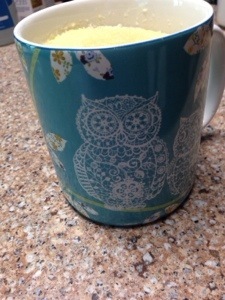 The mug we used was my daughter new coffee dorm mug. The recipe we used was for two mug cakes but will fill one extra huge mug just fine. It was so nice to try something that I know my daughter will most likely make for herself in the future while off at college and get to spend that quality time with her. Cake was tasty. Happy all around as we shared. 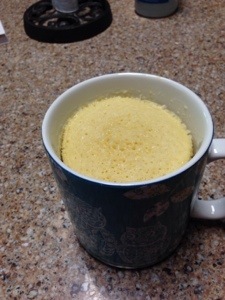 Melt butter in mug. Add in milk, egg , sugar, salt, and vanilla extract. Stir with fork. Add flour last. Bake 1 1/2 minutes to 2 1/2 min in microwave. Time will vary depending on wattage of microwave. Mine took 2 min. Look for it to rise and be firm to touch in mug. Cool a little and add topping. My homemade whip cream was a spoonful of granulated sugar and 1/2 cup of heavy cream. Beat on high for a few minutes to you have soft peaks. Top off with fresh raspberries. Yum! Ohhh I think I have that same cookbook – isn’t it brilliant?! My mother-in-law got me onto mug cakes a few years ago and I’ve been hooked ever since! Enjoy eating your way through the book! !